Glo is here again with yet another data offer for all its customers. Unlike the Glo Welcome Back offer, this new data offer has nothing to do with eligibility, which means all Glo users can actually enjoy it as long as you meet the conditions. 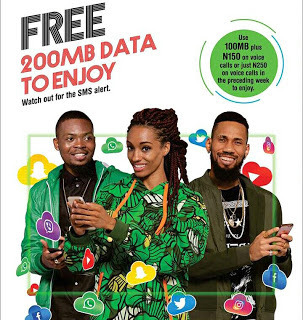 Glo is giving out free 200mb worth of data to it's customers and all Glo users can actually benefit from this data offer. Although it's open to all, there are some conditions you have to meet before you will be rewarded the free data. To benefit from this Glo free 200mb data, you have to spend at least N250 on voice calls or N100 on call + N100 on Data. Once you meet the requirement above, you will instantly be rewarded with your free data. What makes this more interesting is that you don't even have to subscribe to any plan or dial any USSD code to benefit from this. As long as you meet the requirement above. To check your data balance, simply dial #122#.